So, I’m a terrible blogger. I can’t seem to make updates…ever. Then I don’t know how to jump back into blogging because I’ve been away for a while. Anyway, I am going to try to be better but with the holidays I’m not sure how many posts I’ll really be able to do between now and the first of the year. This post is for a recipe that my husband loves, steak chili. Now, this chili is not your normal chili with ground beef, but a thick chili with chunks of tender steak throughout. Slice the steak into strips against the grain then turn to dice into cubes. If you don’t cut the steak against the grain then your steak will be tough instead of tender (trust me, this is the most important step). Add the steak, onion, beer, garlic, chili mix, powders and Ro-Tel to a slow cooker, or cast iron pot. Add the remaining ingredients to the pot and let simmer for 30-45 more minutes or until thickened. 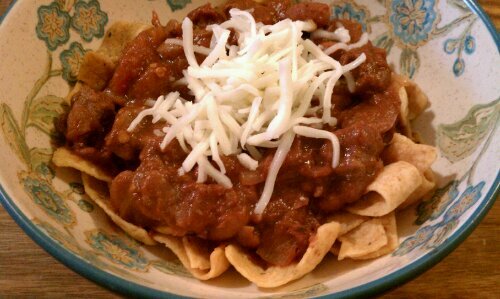 Serve over low sodium Fritos and top with cheese for a great Frito Pie. * I recommend making this in the slow cooker because your chili will be much more tender the longer you can let this cook. The best thing about this chili is that it gets better the longer it sits. I also wanted to say that if you are a true Texan you can always omit the beans but your chili might not be as thick as mine. So, I hope you enjoy this recipe while it is still cold out! So yesterday I felt a bit lazy but still wanted a home cooked meal so I brought out the Crock Pot again. I’m sure you can tell that I use it as often as possible. It’s convenient and gives meals a slow-cooked flavor without me having to do much work at all. That, and dinner is ready after I get home from work. Well, enough about my Crock Pot. I only made a few alterations to the original below. First, I didn’t have any onion so I used dried minced onion instead. Also, I’m not a fan of using flour as a thickener, unless that’s all I have available, instead I like to use corn starch. The only difference is that for the cornstarch to work properly (and not gum up at the bottom of the pan) you just need to make a slurry with a bit of cold water. Lastly, I used twice the amount of mushrooms because I love mushrooms and, I use egg noodles because that is the way my mom always made it. This recipe comes courtesy of Five Little Peaches. Put stew meat into your crock pot and sprinkle chopped onion, salt, pepper and garlic powder over top. In a small bowl combine the broth, ketchup and Worcestershire sauce. Pour over top of meat. Cook on high 4-5 hours. (You can also cook it on low heat for 7-8 hours but I feel like the meat becomes overly tender and falls apart when small pieces of meat are cooked for that long.) After about 3 1/2 hours add mushrooms and cook 30 minutes. 30 minutes later, whisk together the flour and water (or cornstarch and water) and pour into the crock pot. Stir into the meat mixture to thicken. Cover and cook 30 minutes longer. Stir in sour cream just before serving and ladle over top of cooked rice or pasta.